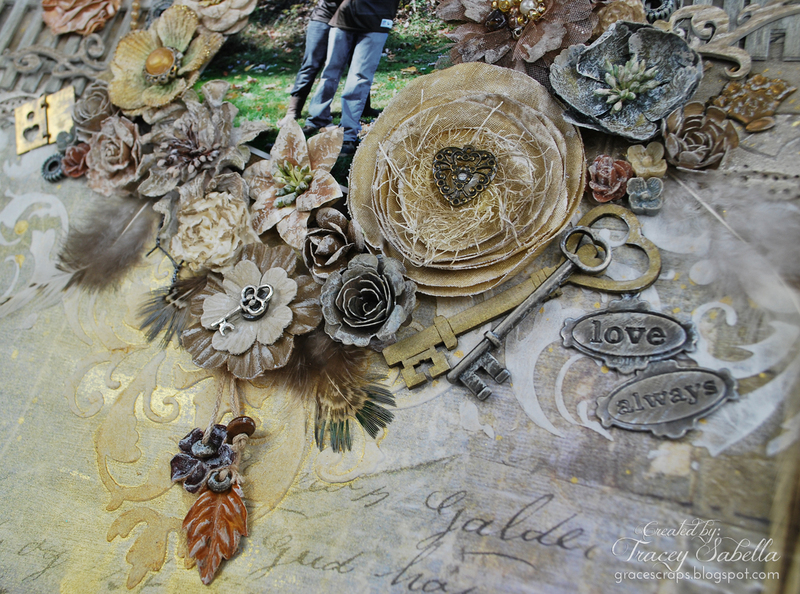 It's Tracey here to share a new Leaky Shed Studio, mixed media layout with you. I'm so blessed to have such a great relationship with our son and his wife, Rachel. This is one of their engagement photos. She was a Steeler's fan while Joseph is a Brown's fan. If you're not familiar with the NFL, that's one big rival, but they have not let it cause a house divided. I've featured some gorgeous Leaky Shed Studio pieces which I've "weathered" with gesso and mist. The details are explained below. I was also inspired by the June Once Upon A...Sketch Challenge. I painted the Leaky Shed Studio Heart Key with Gold Color Shine Mist, then dry brushed with Gesso. The background is stenciled with molding paste, then misted and splattered. 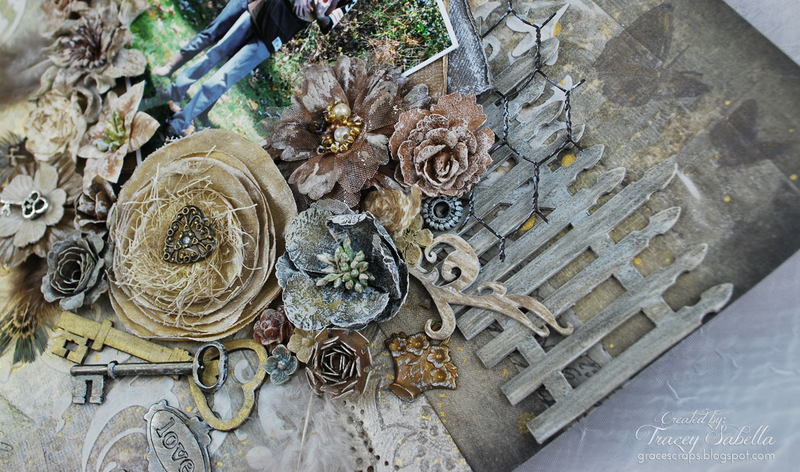 The flowers and metal elements are dry brused with Gesso, then brushed with cork glimmer mist. I wanted the Leaky Shed Studio Picket Fence to look weathered, so I painted it with gesso, with the brush strokes going in the direction of wood grain, then I brushed it with a couple colors of mist that settled into the brush strokes to look like wood. 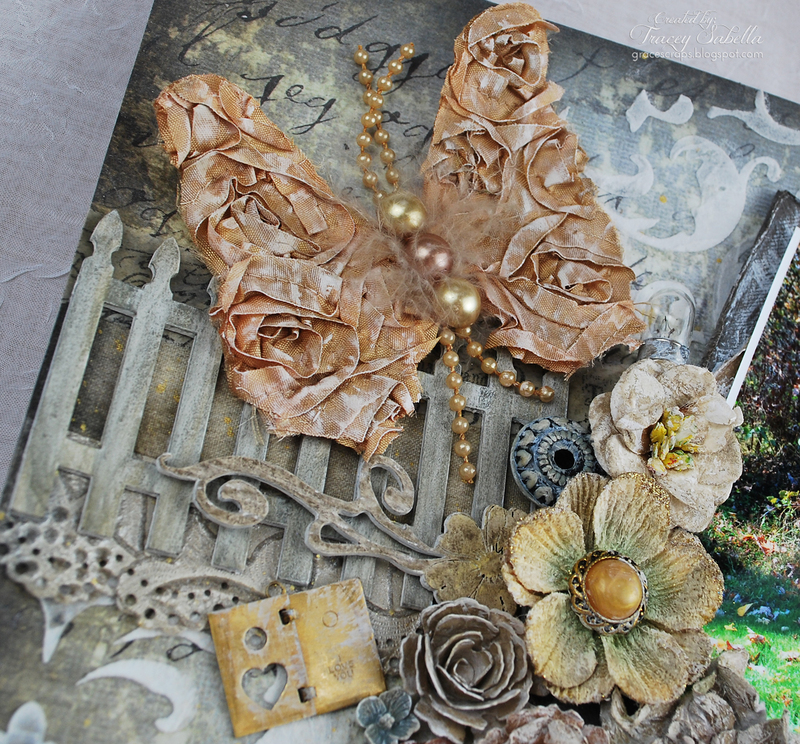 The Prima butterfly wings are also dry brushed with Gesso and mist. I cut the Leaky Shed Studio Harja Flower into pieces and used half on each side of the page. I simply textured with gesso and brushed mist for this gorgeous effect. I've stamped the butterfly images in the corner. 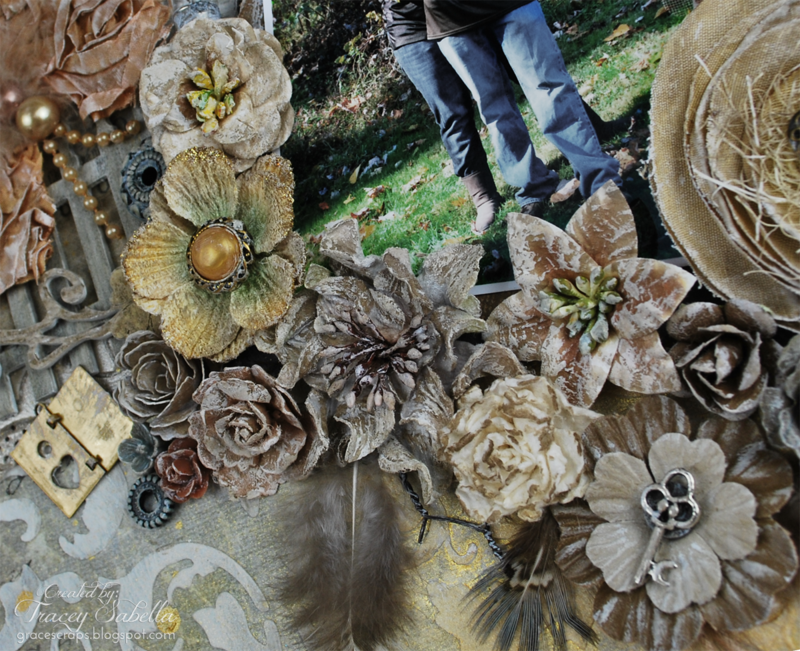 I've used a mix of handcrafted flowers, pre-made flowers, and trinkets to cluster around my photo. I've also tucked in chicken wire and feathers. My Bitty Blossom tutorial can be found here. 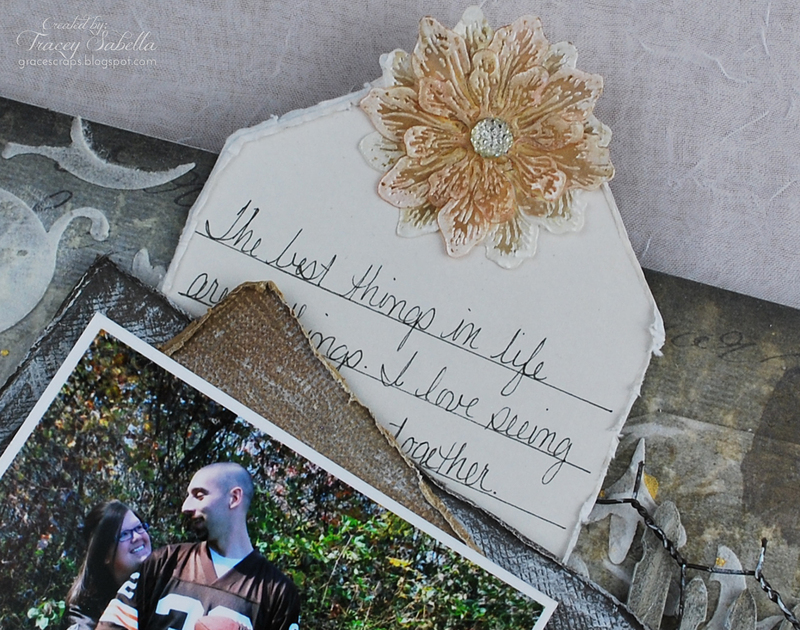 I've included my journaling on a tag tucked behind the photo mats. My handcrafted flower camouflages the tag once it's tucked into place. A tutorial for my Embossed Vellum Flower can be found here. A list of additional products may be found on my blog here. I hope you've been inspired to "weather" some Leaky Shed Studio Chipboard on your next layout! 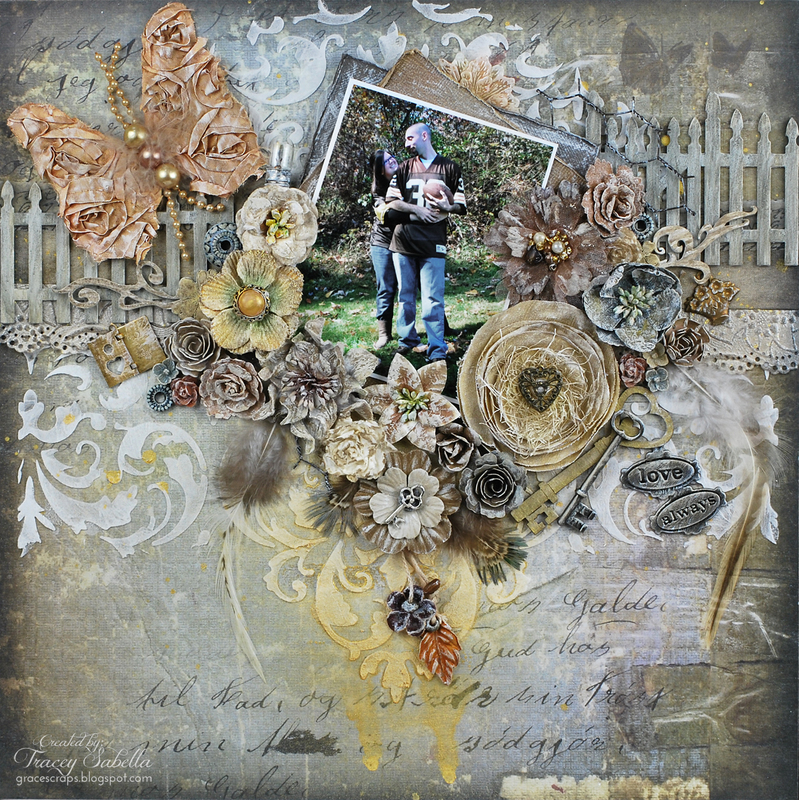 "You Make My Heart Sing"
"Enjoy Today"-simple elegance with Tracey G.
"We can't all travel by Bubble" with Tracey G.
Gears, Watch Parts, and Three Year Olds - Oh My!